MOSCOW -- Russia announced Monday it will supply Syria's government with sophisticated S-300 air defence systems after last week's downing of a Russian plane by Syria forces responding to an Israeli air strike, a friendly fire incident that stoked regional tensions. The Russian Il-20 military reconnaissance aircraft was downed by Syrian air defences that mistook it for an Israeli aircraft, killing all 15 people on board. Russia laid the blame on Israel, saying Israeli fighter jets were hiding behind the Russian plane, an account denied by the Israeli military. Russian Defence Minister Sergei Shoigu announced that the S-300 missile defence systems will be delivered to Damascus within two weeks. Earlier in the war, Russia suspended a supply of S-300s, which Israel feared Syria could use against it. Shoigu went on television to say that Russia is now going to go ahead with the shipment because "the situation has changed, and it's not our fault." Shortly after his statement, Putin got a call from Israeli Prime Minister Benjamin Netanyahu and told him that the Russian move was "aimed primarily at fending off any potential threat to the lives of Russian servicemen," according to the Kremlin." Netanyahu's office said in its readout of the call that the Israeli prime minister "stressed once again that the responsibility for the unfortunate incident lay on the Syrian army that shot it down and on Iran, whose aggression is destabilizing the region." In an apparent reference to the S-300, the statement said "transferring advanced weapons to irresponsible hands will increase the dangers in the region," adding that Israel will "continue to defend its security and interests." Shoigu announced that Russia would also equip Syrian air defences with a new automated control system to enhance its efficiency and help identify Russian aircraft. On top of that, the Russian military will start using electronic countermeasures to jam any aircraft that would try to launch attacks off Syria's coast. "We are convinced that these measures will calm down some hotheads and keep them from careless actions which pose a threat to our troops," Shoigu said. The Israeli military has denied responsibility for the downing of the Russian jet, insisting Sunday that Israeli jets did not hide behind other aircraft and that they were in Israeli airspace when the Russian plane was downed. The Russian military angrily rejected those claims. On Monday, Defence Ministry spokesman Maj. Gen. Igor Konashenkov produced data collected by Russian air defence systems in Syria purportedly indicating that one of Israeli F-16 fighter jets was flying close to the much larger Russian plane, resulting in the Syrian missile homing in on the bigger target. Konashenkov also said that data showed that the Israeli jets remained over the Mediterranean Sea off Syria's coast after the Russian plane was downed. U.S. national security adviser John Bolton meanwhile said Monday that delivery of the Russian S-300 would be a "significant escalation" in already high tensions in the region, and Secretary of State Mike Pompeo said he would raise the matter this week with his Russian counterpart Sergey Lavrov at the U.N. General Assembly. "We think introducing the S-300s to the Syrian government would be a significant escalation by the Russians and something that we hope, if these press reports are accurate, they would reconsider," Bolton said. Russia's Deputy Foreign Ministry Sergei Ryabkov fired back, warning the U.S. against taking "a mentor's tone." International and regional powers backing various sides in Syria's civil war have been carrying out strikes for years, often using special hotlines to prevent aerial confrontations. Israel said its warplanes were targeting a Syrian facility involved in arms shipments to the Iranian-backed Hezbollah group. Israel has launched at least 200 strikes at Iranian and Hezbollah facilities in Syria over the past years, and has maintained a hotline with the Russian military to prevent any collisions. 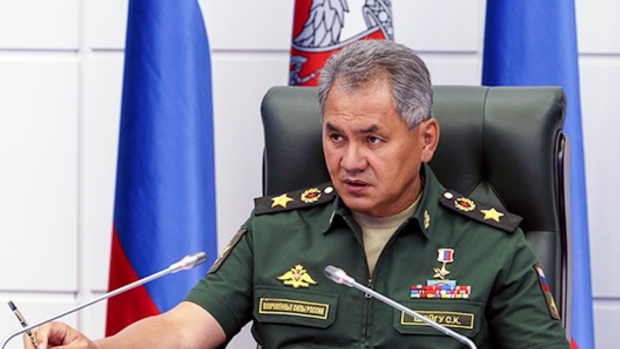 But Shoigu said that the Israeli military warned Russia about last week's strike just one minute before launching it and claimed it was being conducted in Syria's north. Instead, the Israeli jets targeted the western province of Latakia, putting the Russian warplane in the line of fire. Russian officials said Syria's Soviet-made S-200 systems, one of which downed the Russian plane, weren't sophisticated enough to identify the Russian aircraft as a friendly one. Russia launched its campaign in support of President Bashar Assad in 2015, eventually turning the tide of war in favour of Syrian government forces. Moscow has tried to maintain good relations with Iran, which is also allied with the Syrian government, and Israel, which is wary of Iran's growing influence in Syria. The downing of the plane came just hours after Russia announced it had reached a deal with Turkey to avert a Russian-backed Syrian government offensive against the northwestern province of Idlib, controlled by a mix of radical groups and Turkey-backed armed opposition. Syrian state TV said insurgents shelled a government-controlled crossing east of Idlib on Monday that was reportedly prepared to allow civilians to leave the province. Concerns are rising in Idlib over the details of the deal and how it will be implemented. The province is home to some 3 million Syrians, half of them displaced by violence in other parts of the country. Hard-line armed groups have rejected the deal, saying it aims to strip the opposition of weapons and is a victory for Assad's government. On Sunday, tribal leaders and prominent local figures meeting in Idlib said they distrusted Russian mediation, citing Russia's previous cease-fire violations. The conference called on armed groups not to leave the front lines in Syria or hand over their weapons.